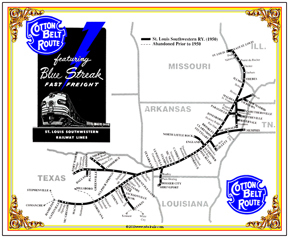 The St. Louis-Southwestern Railroad was known as the Cotton Belt Route. It became part of the SP and is now a part of the UP. Products bearing individual marks are licensed marks owned by Union Pacific Railroad Company and are used under an active license agreement. 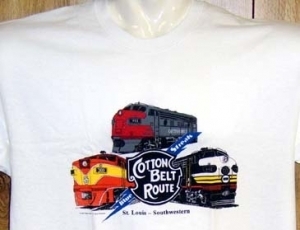 Cotton Belt T-shirt features three cab unit diesel in three distinct color schemes used by the St. Louis-Southwestern/Cotton Belt Railroad. Now part of the UP Railroad. Cotton Belt Coffee mug featuring the beautifully restored and magnificant steam No. 819. Colonel Cotton Belt is on the reverse side of this mug. Cotton Belt ran America's fastest freight train back in the day. 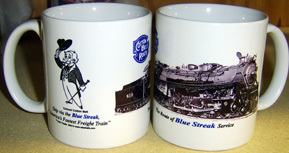 Cotton Belt Coffee mug featuring three diesel color schemes used by the St. Louis-Southwestern Railroad. One other color scheme was used on its original FT diesel purchase. They were Confederate Grey, red and Epaulet Yellow. Coffee Mug featuring the Cotton Belt Railroads logo superimposed over the original paint scheme of its diesel locomotives. A very unique way to present the railroads logo. Three color schemes used by the St Louis Southwestern Railroad, the Cotton Belt are emblazoned on this 6 in x 6 in tin sign, along with the Cotton Belt Logo and Blue Streak image. New FT diesels of the St Louis Southwestern Railroad, the Cotton Belt on this 6 in x 6 in tin sign, along with the Cotton Belt logo. 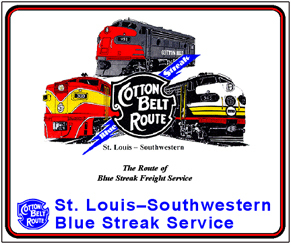 Colorful Cotton Belt Logo of the St Louis Southwestern Railroad. Colorful Cotton Belt Logo of the St Louis Southwestern Railroad with its Lone Star logo image used to promote its passenger trains in Texas. 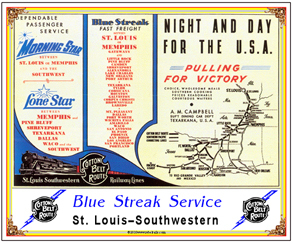 Colorful Cotton Belt Logo promoting the smooth rails of the St Louis Southwestern Railroad with its Lone Star passenger trains in Texas. Classic Cotton Belt logo is featured on this metal license plate. St. Louis-Southwestern operated one of the fastest freight train in the nation for a time. Cotton Belt Mouse Pad featuring a collage of diesels used by the railroad. 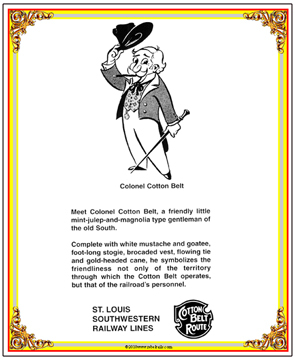 Tin sign featuring Colonel Cotton Belt, southern gentleman of the St. Louis-Southwestern Rail Lines. Border is Confederate Gray and Epaulet Yellow, same as their first FT diesels. Tin sign featuring an old ad promoting Americas Fastest Freight Train operated jointly by the Cotton Belt and the Southern Pacific. Post Haste! Tin sign featuring a collage of Cotton Belt locomotives, diesel and steam. Tin sign featuring route map of the Cotton Belt Route between St. Louis and the Great Southwest. 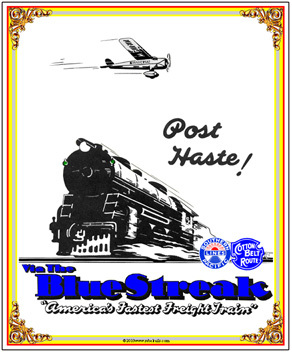 Tin sign featuring an advertisement ran by the Cotton Belt Railroad highlightling its fast blue streak freights and convenient passenger service during World War II.